But the fight isn’t over. Please see the past decisions we’ve posted under the RTB Hearing Decisions tab. West End residents rally against landlord. 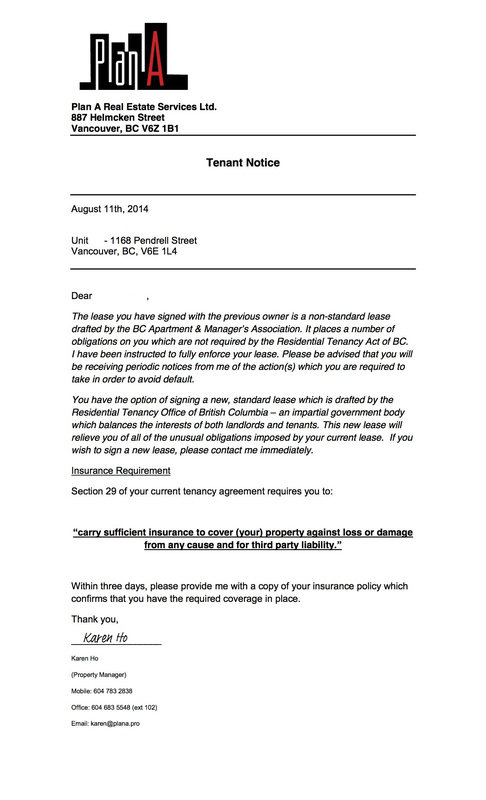 Landlord compliance with the Residential Tenancy Act? We respect that the landlord holds the opinion that he and his businesses are fully compliant with the Residential Tenancy Act. We offer the following as one example of many to consider. We will be posting more examples over the next several days. 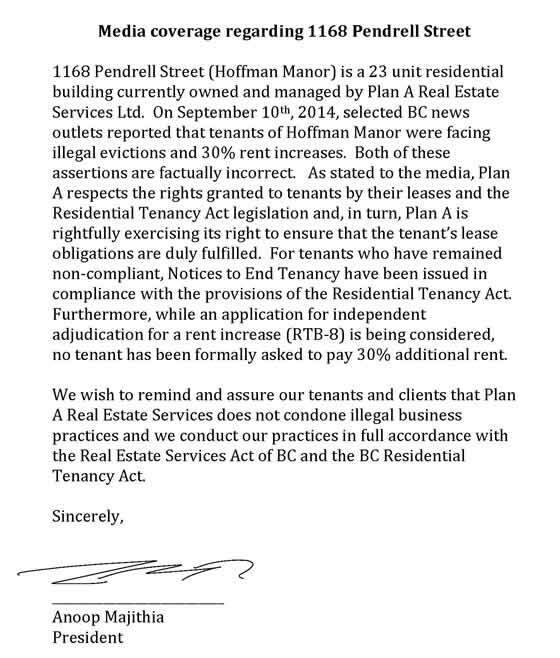 This notice of entry was signed by Anoop Majithia, managing broker of Plan A Real Estate Services Ltd. and served on tenants’ doors on Thursday, August 14, 2014. The first set of notices of eviction for @1168Pendrell were issued that same day, likely posted on tenants’ doors at the same time. Any emphasis in the following is added for convenience. (d) if given or served by leaving a copy of the document in a mail box or mail slot, on the 3rd day after it is left. (f) an emergency exists and the entry is necessary to protect life or property. 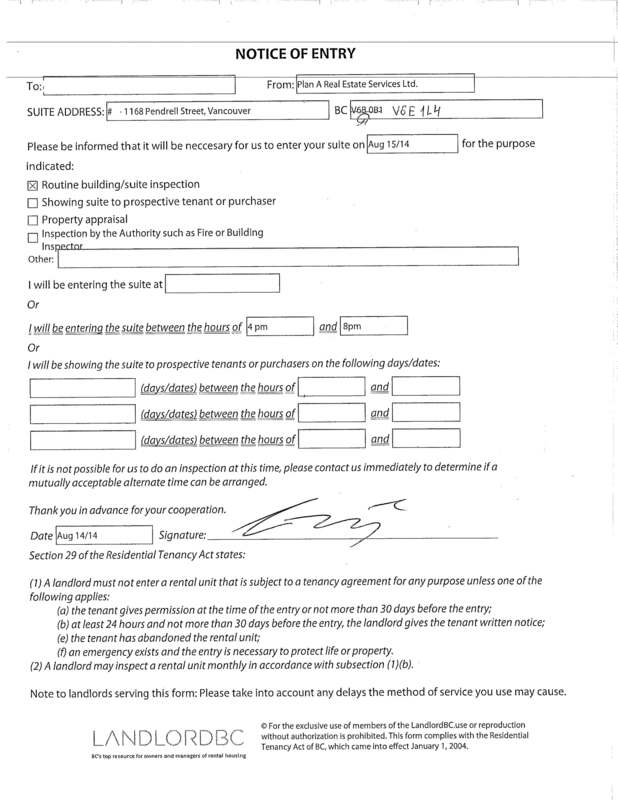 (2) A landlord may inspect a rental unit monthly in accordance with subsection (1) (b). Isn’t this something that is taught in Landlord101? Can someone remind me how many years of rental property management experience does the landlord and his property manager have? Now imagine for a moment: you come home from work Thursday night at 10 pm and find this notice of entry on your door. You are confused because you’ve just had two landlord suite inspections in the past 7 days. Then you find out that your landlord has served 6 of your neighbours eviction notices that same day and he has posted on your door that he is coming into your apartment in less than 24 hours. Wouldn’t you like to be at home when the landlord enters for a third suite inspection in the first 11 days that the landlord took possession of the building? Wouldn’t you be worried if the purpose of the landlord’s “inspection” is to find some reason to evict you? What if you can’t get time off work to be present when your landlord is inside your suite? What if you are so distracted at work the next day you can’t get anything done because you are wondering what your landlord is doing inside your apartment? Media and City representatives have been invited.